Erving, MA Resident Ruth Johnson. Ms. Johnson was recently honored for her years of service to Nonotuck Resource Associates, Inc.
For more than 40 years Nonotuck Resource Associates has helped transform the lives of hundreds of people with intellectual and physical disabilities by offering the personalized service of shared living and Adult Family Care. Erving resident Ruth Johnson was an integral part of that transformation. 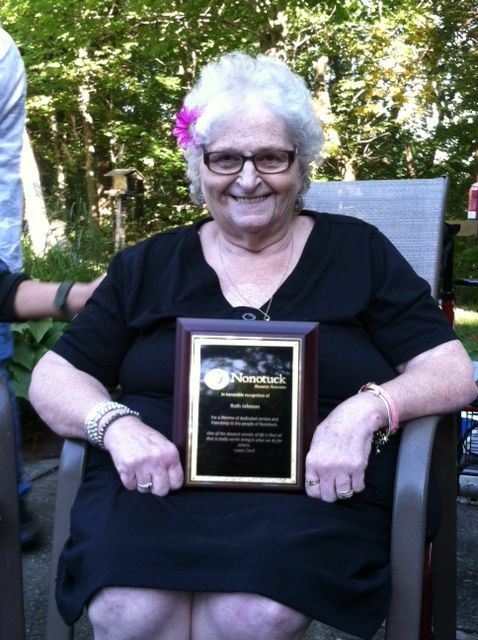 For her dedication and commitment, Nonotuck recently honored Ms. Johnson at a recognition ceremony on September 30. Ms. Johnson started with Nonotuck in 1988 after having worked in the human services field for nearly 20 years. At Nonotuck, she worked primarily as a Program Director until she became a caregiver herself in 1993, helping two women transition out of the Monson Developmental Center. Ms. Johnson’s relationship with these women lasted many, many years and became the foundation for her direct support to many other individuals in need over the years, lasting through the summer of 2011 until health challenges made it difficult for her to continue. Over the years, Ms. Johnson created an incredible legacy of love, supporting many individuals with her husband Art in their various homes as they moved throughout Franklin County. Over time, many of her family members, friends, co-workers and neighbors learned of her shared mission and became involved in supporting individuals themselves: sometimes through providing respite to Ms. Johnson or other caregivers. Or sometimes by becoming caregivers themselves. As part of the recognition ceremony for her devotion to Nonotuck’s efforts, Ms. Johnson received a silver Pandora bracelet with various charms representing specific people she and Art shared their homes and lives with. She also was presented with a plaque with a fitting quote from author Lewis Carroll: “One of the deepest secrets of life is that all that is really worth doing is what we do for others”, a sentiment that truly reflects what Ms. Johnson captured in her own life and heart and gladly shared with others through Nonotuck for so many decades. Based in Florence, Massachusetts but with offices across Massachusetts, Nonotuck offers Shared Living, Adult Family Care and Day Services for families who choose to care for their loved ones suffering with Alzheimer’s, autism, brain injuries, cancer, muscular dystrophy and other intellectual and physical disabilities at home. For complete information on Nonotuck Resource Associates, including office locations, you can visit www.nonotuck.com or call Nonotuck’s corporate office at 413-586-5256. 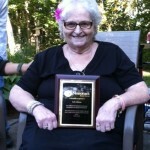 Client News adult family care, Nonotuck, shared living"